Elizabeth Chang, violinist, enjoys a multi-faceted career as performer, teacher, and arts administrator. Her performing career has taken her to more than twenty countries and her chamber music appearances have included collaborations with many of today's leading artists. She is currently a faculty member of the University of Massachusetts Amherst and the Pre-College Division of the Juilliard School. Committed to finding an organic intersection of performance, teaching, and artistic leadership, Ms. Chang has, over the course of her career, launched and led various performance and teaching projects. She is Artistic Director and co-founder of the Lighthouse Chamber Players (Cape Cod) as well as co-founder and co-organizer of the Five College New Music Festival and the UMass Amherst Bach Festival and Symposium. She also co-founded the NYU Intensive Quartet Workshop in the summer of 2002 and founded and directed The School for Strings Intensive Chamber Music Workshop from 2003-2007. With the goal of engaging students in the performance of newly commissioned music, she created the Violin Duo Project as an offshoot of the Five College New Music Festival. After five incarnations of the festival, 32 new short duos with pedagogical intent thus far have been composed for and premiered by students, adding substantially to the literature for this genre. Ms. Chang has also worked closely herself with a number of composers on new works for violin and including violin, most notably and extensively with Salvatore Macchia, Eric Sawyer, and Lewis Spratlan. In recent summers, she has participated in Green Mountain Chamber Music Festival (Vermont), ARIA International Music Festival (Massachusetts), Interharmony Festivals (Germany), Vianden International Music Festival (Luxembourg) and Brancaleoni International Music Festival (Italy). 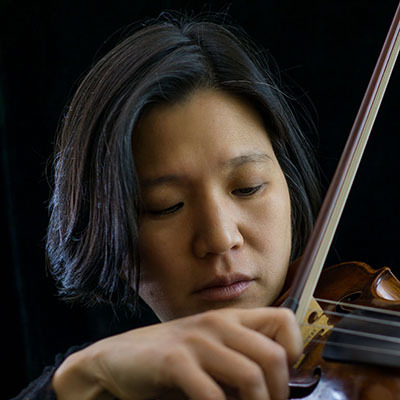 Prior to her appointment to UMass, Ms. Chang toured and recorded extensively with the Orchestra of St. Luke's and the Orpheus Chamber Orchestra and performed with a number of new music groups based in New York City. She was formerly an Artist Faculty member of New York University and of the Mason Gross School of the Arts at Rutgers University; for many years she also served as head of chamber music and violin faculty member at The School for Strings and as a member of the faculty of the Harlem School of the Arts. A native New Yorker, Ms. Chang’s primary teachers were Louise Behrend, Joseph Fuchs, Roman Totenberg, and Max Rostal. She also worked closely with Leon Kirchner and Luise Vosgerchian. She is a graduate of Harvard University and was the recipient of the Presidential Scholar in the Arts Award and the Beebe Fellowship for Study Abroad awarded by New England Conservatory.